Martin Sensmeier - Bio, Is He Married, Who Is The Wife, What Is His Net Worth? Martin Sensmeier – Bio, Is He Married, Who Is The Wife, What Is His Net Worth? Martin Sensmeier is a brilliant American actor, famously known for his remarkable performance in the 2016 movie, The Magnificent Seven. It was his role as the lead character, Red Harvest in the movie that shot him to the limelight. The actor began his acting career in 2014 when he appeared in the short film, K’ina Kil: The Slaver’s Son. Since then, he has continued to make strides in the American movie industry. Despite being a newbie in the industry, Martin has played prominent roles in a good number of thriller movies. Asides from acting, he is also a model. Join us as we take on an interesting ride through the life of the Magnificent Seven star below. Read on! Martin Sensmeier was born on June 27, 1985, in Anchorage, Alaska in the United States. He is American by nationality but of Tlingit, Koyukon-Athabascan origins. His father, Raymond Sensmeier is Tlingit while his mother, Eva Sensmeier is Koyukon-Athabascan. His parents who were of subsistence background raised him in the small coastal and traditional village of Yakutat, Alaska where he schooled. Growing up, Martin always dreamed of becoming an actor. He would make his own props and costumes and dress up like the characters he had seen in movies. He first had the opportunity to participate in a theater play in his fourth grade and continued doing plays until junior high. However, during high school, he trained in welding to make ends meet. Before venturing into acting, Martin first worked as a welder while schooling part-time at the University of Alaska, Anchorage where he studied for just two years before dropping out. He later got a job at Doyon Oil, a drilling company at the oil rig in North Slope. In 2007, while still working at the rig, Martin started taking part-time acting classes in Los Angeles in pursuit of his acting dreams. He lived in Southern California, from where he plied to work in North Slope on weekdays and to school in Los Angeles on weekends. In 2011, he finally decided to quit the oilfields and moved permanently to Los Angeles in order to pursue a full-time acting career. He first got into modeling which he did for some years. According to Sensmeier, modeling served as the stepping stone into his main lifetime ambition – acting. Beginning his acting career, Martin Sensmeier encountered serious difficulty in getting roles owing to his native background. For a period of about three years, he kept auditioning without getting picked for a role. What a frustrating experience! Martin, however, persevered until 2014 when luck shined on him. He landed his first film role in the short film, K’ina Kil: The Slaver’s Son where he starred as Tintah. He later got his first feature film role in the science-fiction movie, Encounter. Martin’s big break later came on in 2016 when he starred in a remake of The Magnificent Seven. Martin portrayed lead character ‘Red harvest’, one of the seven in the western action movie. Preparing for the role of Red harvest, a native American warrior and archer proved a very herculean task for Martin. His daily training routine for the role included a two-hour bare-back horse riding practice, a strenuous workout session at the gym, a ridiculously rigid diet, among others. His hard work was, however, handsomely rewarded as the role saw him star alongside Hollywood giants like Denzel Washington, Chris Pratt, and Ethan Hawke. 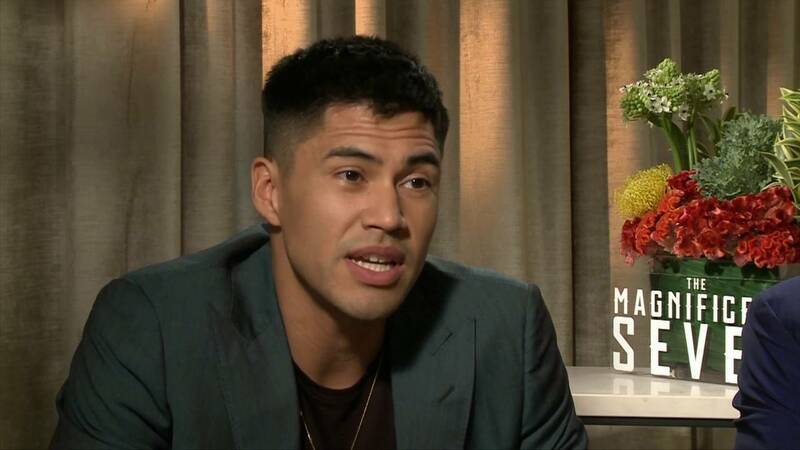 In 2017, Martin Sensmeier portrayed the character of Chip Hanson in the murder mystery film, Wind River alongside One Tree Hill star, Kelsey Chow who starred as his sister, Natalie Hanson. 2018 was quite a busy year for Martin as he starred in four films namely; Perfect, Westworld, Beyond the Sky, and Spare Room. Sensmeier is currently shooting as Montford Johnson in the yet-to-be-released biographical film, The Chickasaw Rancher. He would also star alongside Angelina Jolie in the native American biopic, Bright Path: The Jim Thorpe Story. In addition to being an actor, Sensmeier is also a wellness activist. He is the advocate for the Native Wellness Institute as well as the Boys and Girls Clubs of America. He loves doing roles that reflect his ancestry and engaging in activities that give back to Native American communities. Sensmeier has a current estimated net worth of $500,000. He apparently makes his income mainly from his acting career since he currently has no known businesses or endorsements. With his fast-rising status in the film industry, his net worth has the prospects of skyrocketing in the future. Is He Married, Who Is The Wife? Martin Sensmeier isn’t married yet but he is having a relationship with a lady named Kahara Hodges. Hodges is a Navajo Native American singer and entertainer. She is currently the lead vocalist for ‘Dine’ Urban Voices,’ a Phoenix Indian Center’s Navajo singing group. The couple began their love story in 2016 and has been together for over two years. Meanwhile, they have decided to keep their affair to themselves; none of them have spoken to the media about their relationship. One only gets to know about them via Instagram where they often share photos from their lovely moments.